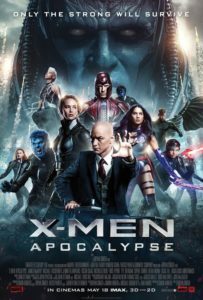 Although perhaps not as clear-cut as the Batman film The Dark Knight Rises in terms of making the “superhero” the bad guy (a right-wing capitalist vigilante) and the “supervillian” the good guy (an enlightenment-era agent of revolution-from-below), X-Men: Apocalypse follows a similar trajectory. Apocalypse AKA En Sabah Nur (Isaac) is a powerful ancient mutant who is unearthed in the 1980s and seeks to destroy (mostly capitalist) human civilization. He starts by safely destroying all of the world’s nuclear weapons (just like star child). The X-Men gather to defeat him. The thing is, it is mostly just assumed that the audience should oppose Apocalypse. This film does not explain why he is bad. He claims to bring the world peace. He takes steps in that direction, by getting rid of the nuclear weapons, promoting two women in his “administration,” etc. Yes, he does destroy a lot of things and kill some people — some of them monstrous. But should he just be seen as a metaphor for the ancient tradition of Jubilee, the “year of the lord,” in which a (usually new) ruler would annul all personal debts and declare a clean slate? In that sense, can the X-Men be considered like Obama/Clintonite neoliberals, defending the financial sector from the villagers and their “pitchforks” and the possibility of “old testament justice” (as the disgraced Treasury Secretary Tim Geithner snidely opposed after the 2007 financial crash)? True, in the film Professor X (McAvoy) pleads for the strong to protect the weak, rather than for the strong to join Apocalypse. But, it is fair to ask whether the X-Men are really defending the weak, or merely cynically pretending to do so while supporting present-day institutions by which the strong systematically oppress the weak (what is sometimes called “structural violence”). On top of that, the overall story is a little disjointed in trying to introduce too many characters. But on the plus side, this film has better dramatic acting than most superhero films, and it does convey emotion in an effective way at times.